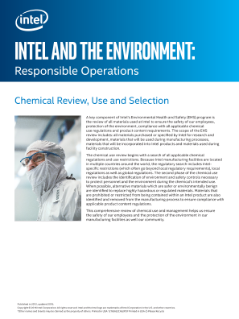 A key component of Intel’s Environmental Health and Safety (EHS) program is the review of all materials used at Intel to ensure the safety of our employees, protection of the environment, and compliance with all applicable chemical use regulations and product content requirements. The scope of the EHS review includes: all materials purchased or ...specified by Intel for research and development, materials that will be used during manufacturing processes, materials that will be incorporated into Intel® products, and materials used during facility construction. The chemical use review begins with a search of all applicable chemical regulations and use restrictions. Because Intel manufacturing facilities are located in multiple countries around the world, the regulatory search includes Intel-specific restrictions (which often go beyond local regulatory requirements) and local and global regulations. The second phase of the chemical use review includes the identification of environment and safety controls necessary to protect personnel and the environment during the chemical’s intended use. When possible, alternative materials which are safer or environmentally benign are identified to replace highly hazardous or regulated materials. Materials that are prohibited or restricted from being contained within an Intel® product are also identified and removed from the manufacturing process to ensure compliance with applicable product content regulations. This comprehensive review of chemical use and management helps us ensure the safety of our employees and the protection of the environment in our manufacturing facilities as well our community. Read the full Intel Chemical Review, Use and Selection.